MONTRÉAL, Aug. 22, 2018 /CNW Telbec/ - Canada Infrastructure Bank and CDPQ Infra, a wholly owned subsidiary of Caisse de dépôt et placement du Québec, have reached a business agreement on the investment by Canada Infrastructure Bank in the Réseau express métropolitain project (REM) in Montréal, a 67-km, light rail, high-frequency network with 26 stations. The $1.28-billion investment completes the project's $6.3-billion financing. The agreement is subject to the execution of the final documentation. "We are pleased to participate in the funding of this important public infrastructure project," said Pierre Lavallée, President and CEO of Canada Infrastructure Bank. "Public transit is one of our priority areas. Our role is to invest alongside private sector and institutional investors, and other public-sector partners to facilitate the development of strategic projects like the REM." "We are very pleased to welcome the Canada Infrastructure Bank as a partner in the REM project. With this $1.28-billion investment, the REM's financing is now fully completed. The construction of the project is progressing well and will intensify in the fall," said Macky Tall, President and CEO, CDPQ Infra. Construction of the REM began in April 2018. The first trains are scheduled to run in the summer of 2021. The Canada Infrastructure Bank's $1.28-billion investment will take the form of a 15-year senior secured loan at a rate starting at 1% escalating to 3% over the term of the loan. 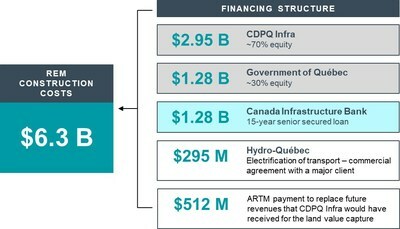 Given that the Canada Infrastructure Bank's investment takes the form of a loan, CDPQ Infra's equity stake in the REM project will be approximately 70% and the Government of Québec's stake will be approximately 30%. Dollar amounts for both CDPQ Infra's and the Government of Québec's investments remain unchanged, staying at respectively $2.95 billion and $1.28 billion. Returns on equity also remain the same, at 3.7% for the Government of Québec and 8-9% for CDPQ Infra. Canada Infrastructure Bank attracts private sector and institutional investment and co-invests in new revenue-generating infrastructure projects that are in the public interest. By engaging the expertise and capital of the private sector, the Bank will help provide more infrastructure for Canadians. For more information, visit www.canadainfrastructurebank.ca. CDPQ Infra is a wholly owned subsidiary of Caisse de dépôt et placement du Québec and is responsible for developing and operating infrastructure projects, including the Réseau électrique métropolitain (REM). The REM is a new, integrated 67-km public transit network intended to link downtown Montréal, the South Shore, the West Island (Sainte-Anne-de-Bellevue), the North Shore (Laval and Deux-Montagnes) and the airport through the operation of an entirely automated and electric light rail transit (LRT) system. For more information on CDPQ Infra, visit cdpqinfra.com, follow us on Twitter @CDPQInfra or consult our Facebook page.